As stated in Chap. 6, the maintenance of extracellular fluid (ECF) volume is dependent on the extracellular concentration of Na+ ([Na+]). An increase in total body Na+ causes an expansion in ECF volume and a decrease in total body Na+ reduces ECF volume. 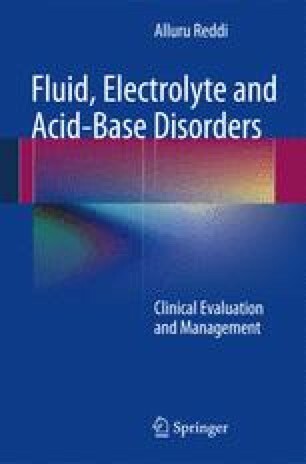 Most of the critically ill patients and patients with less availability of salt and water develop volume contraction, because it is rather difficult to induce volume contraction in humans with normal renal function. The signs and symptoms of volume contraction depend on the rapidity of Na+ loss. Sudden loss of Na+ causes a marked reduction in blood pressure and cardiac output, whereas slow and sustained loss results in a slight decrease in blood pressure. Pure water loss results in hypertonicity with high serum [Na+], whereas loss of both Na+ and water leads to low blood pressure.